Once you are accepted as a patient, all you have to do is return for your appointments and follow the Doctor’s recommendations. 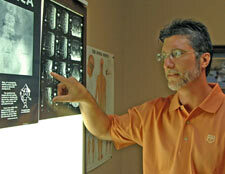 We know that Chiropractic works and your body will do a better job healing if we aim it in the right direction. Most of our patients experience symptom relief within 5-7 visits. As an established Gillis Chiropractic patient, a typical office visit should take approximately twenty minutes from beginning to end. Simply sign yourself in at the front desk, we’ll take you back immediately to begin your therapies; then Dr. Gillis will treat you and you’re on your way! We pride ourselves on “No Waiting” “No Hassles,” and “Same Day Treatment” with No Appointment Necessary. Spinal problems rarely get better on their own. Call Gillis Chiropractic Clinic today to get started with chiropractic care!